Newly renovated property in the heart of the French Quarter within walking distance of great attractions like The House of Blues; world famous restaurants such as NOLA, Galatoire's, Arnaud's and more; also only a few blocks from Bourbon Street and the Casino. One block away is a local watering hole by the name of the Chart Room Bar at 300 Chartres. Meet the locals or just people watch. Sobou (South of Bourbon) Bar and Restaurant is great for dinner or if you want drinks at a more upscale location. Walk to Central Grocery for a Muffaletta, or to Cafe du Monde for cafe' au lait and beignets. Frenchman St. at the back of the Quarter has great local entertainment including Snug Harbor for dinner and jazz depending on who's playing. The neighborhood has many restaurants and bars ranging from formal to casual. Come for Mardi Gras, or other great events like French Quarter Fest, Jazz Fest, Satchmo Fest and you'll be within walking distance to enjoy whatever you please! There is always something going on in town and this property gives you to opportunity to enjoy anything and everything the Big Easy has to offer! The building is close to the Canal Streetcar line (one block off the line) so it's a breeze to make it Uptown or to MidCity to do cemetery tours or enjoy the restaurants/bars that the locals enjoy. Born and raised in New Orleans. Property is basically family owned and operated. We completely refurbished and put back into commerce a property that was neglected for many years. The 300 block of Decatur St where the property is located has undergone major reconstruction over the last 3 years. We are in the process of renovating other properties in the french quarter. We are proud to contribute to the French Quarter's improvement. This condo was perfect. Its so calming inside, and a great way to get away from the busy streets of NOLA. It’s also in a great location, right in the middle of everything. We would stay again! 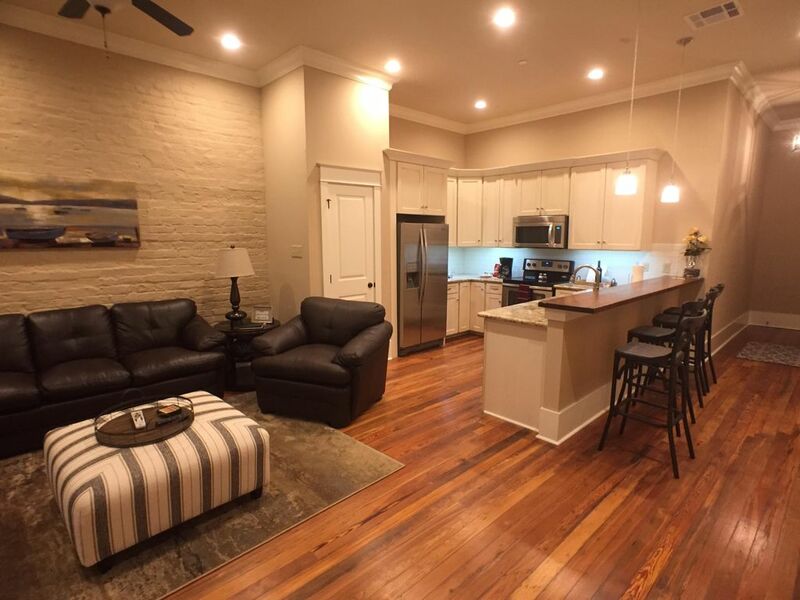 Loved the Apt, Perfect location in the quarter , quiet and very clean . We will returning and renting this unit again . The Owners are very responsive . We have rented this condo several times and love it! The owners are so nice and easy to contact and respond to any questions you might have. It is well stocked and you’ll find neat little surprises they supply. LOCATION! It’s the best. You can walk easily anywhere in the Quarter and it’s only a couple of blocks from the river. Fabulous restaurants all around you. I know we’ll be back! Staying at this condo while visiting NOLA was one of the highlights of our trip! The condo was definitely like a home away from home. It was super clean, quiet, comfortable, and within walking distance to so many places! One of, if not the best VRBO properties I have ever stayed in. I will definitely be booking this location again!! We rented two apartments in this location and both were fantastic. Great location, good value, responsive hosts. We will definitely look to stay here again when we return.